A recent study by Transparency Market Research (TMR) suggests that the revenue in the global synthetic leather market is divided among a few players who have a strong manufacturing and distribution infrastructure in place. The report identifies Kuraray, SAN FANG CHEMICAL INDUSTRY CO., LTD., Asahi Kasei Corporation, Toray Coatex Co. Ltd., ALFATEX, FILWEL CO., LTD., and H.R. Polycoats Pvt. LTD. as some of the key companies currently holding position of strength in the global synthetic leather market. If the projections of the TMR report is to be believed, the demand in the global synthetic leather market will increment at a notable CAGR of 6.9% during the forecast period of 2017 to 2022. Increasing from its evaluated worth of US$74.6 bn in 2016, the valuation of the synthetic leather market is estimated to reach US$136.7 bn by 2022. The vendors operating in the synthetic leather market are catering to diverse application sectors, including automotive, furnishing, footwear, bags and purses, clothing, and others. 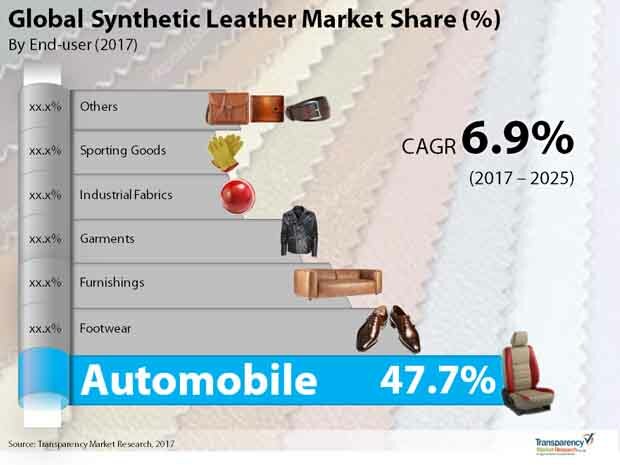 Based on end-user, the global synthetic leather market has been segmented into automobile, sporting goods, furnishings, garments, industrial fabrics, footwear, and fashion accessories including wallets, belts, and bags. In terms of revenue, automobile is the leading end-user constituting more than 40% of the global synthetic leather market. Geographically, vastly populated Asia Pacific is currently the most profitable region, gaining traction from increasing population coupled with rising disposable income in countries such as China, India, Vietnam, and Thailand. Furthermore, rising joint ventures and capacity expansion by various manufacturers and emphasis on reducing carbon emission typically in China is also influencing the market positively in the region. The demand in the global synthetic leather market is driven by a number of factors, such as growing demand from the footwear industry as a result of escalating population, no involvement of animal killing, which has strong support from various governments and preferred by knowledgeable consumers, and synthetic leather’s advantages over pure leather. Synthetic leather are available in variety of colors, and is cheaper than natural leather as well as superior to real leather because of its diversity in looks and use. In the recent past, artificial leather has gained popularity as ideal alternative, especially for the rapidly growing automotive industry, wherein synthetic leather is used for the production of seats, airbags, belts, seat-covers, steering cover, door panels, dashboard, rear shelves, and other interior trim. The demand for passenger cars is seen new higher each year in developing countries such as China and India. Polyurethane is now being commonly employed by the automotive industry as it is softer and offers a non-sticky feeling, unlike an animal-skin-based leather. Consequently, a number of original equipment manufacturers (OEMs) manufacturers have started to prefer it over real leather. Increasing disposable income among the urban population is driving the footwear industry, wherein consumers are now willing to pay for premium products at high cost. The demand for better fit, stylish, and comfortable shoes has escalated in the recent times. Similar traction is coming from the home and offer furniture segment. As the corporate sector flourishes in various emerging economies, the demand for sofas, chairs, and bean bags is expected to increase multiple folds, and thereby augmenting the demand in the global synthetic leather market. In the near future, the vendors operating in this market are expected to focus on the development of bio-based synthetic leather and open new revenue opportunities. On the other hand, the harmful effects of polyurethane (PU) and polyvinylchloride (PVC) is challenging the market for synthetic leather from attaining its true potential. The information presented in this review is based on a Transparency Market Research report, titled, Synthetic Leather Market (Type - Polyurethane, Polyvinylchloride; End-user - Automobile, Furnishings, Sporting Goods, Garments, Footwear, Industrial Fabrics) - Global Industry Analysis, Size, Share, Growth, Trends, and Forecast 2016 - 2025.